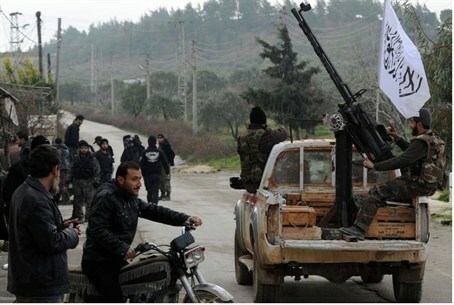 The Syrian military carried out a defensive ambush against a group of rebel fighters who infiltrated a military post. Syrian troops killed at least 62 rebels in an ambush Wednesday near Damascus, the Syrian Observatory for Human Rights said, AFP sources confirmed. The Syrian military said those killed were members of the jihadist Al-Nusra Front. "At least 62 rebels fell as martyrs, most of them youths, and eight others are missing after an ambush by regime forces at dawn near the industrial city of Adra," northeast of the capital, the monitoring group said. A Syrian military source quoted by state news agency Sana said the "army carried out an ambush on a group of terrorists belonging to the Al-Nusra Front that was trying to infiltrate Eastern Ghuta and attack a military post." "All the terrorists were killed and their arms captured," the source added, without giving a toll. Adra, 35 kilometres (22 miles) from Damascus, is the gateway to Eastern Ghuta, a farming region where a large number of rebels are located. On July 21, 49 rebels were killed in fighting with loyalist forces in Adra, the Britain-based Observatory said.